This is a Beautiful Double Dolphin Bracelet, in Sterling Silver. 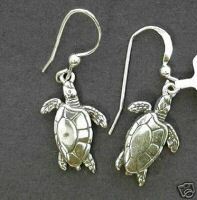 Turtle Earrings, in Sterling Silver. Dolphin Cuff Bracelet in Sterling Silver and Gold with Inlay.